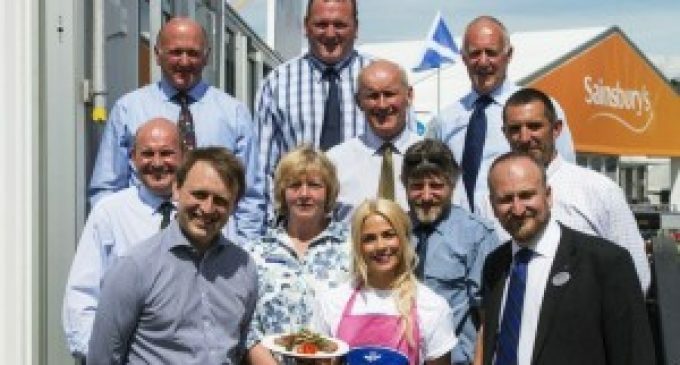 Television presenter Cat Cubie (pictured front-centre) joined representatives from the Scottish sheep industry at the Royal Highland Show last month to unveil a new Scotch Lamb PGI initiative set to be fully launched later this summer. Working together on the joint initiative, Quality Meat Scotland, NFU Scotland and the National Sheep Association are getting behind Scotch Lamb by creating a wide-scale sampling activity by farmers at supermarkets around Scotland. Taking place over one special weekend, the sampling activity will dovetail with QMS’s marketing campaign behind Scotch Lamb. The successful Wham Bam Thank You Lamb initiative, which launched last August, aimed to communicate how simple it is to cook quick, tasty midweek dishes with Scotch Lamb, and was recognised with two silver awards at the Scottish Marketing Society Awards in June. ‘We are looking forward to working closely with NFU Scotland and NSA on this initiative, and are pleased with the response so far from farmers around the country,’ said QMS Chairman, Jim McLaren.